The last few weeks of the school year are often characterized as a time when the campus is alive with knots of earnestly cramming students, late-night study sessions and social media feeds lit up protesting paper submission deadlines. Yet increasingly, colleges are trying to avoid students exhausting themselves on caffeine and the stress of finals by hosting events that support them and make the rigors of the last weeks of school seem a little more bearable. One school that takes stress reduction seriously is Virginia’s Radford University, where this year’s events took on the theme of a seasonal treasure hunt. 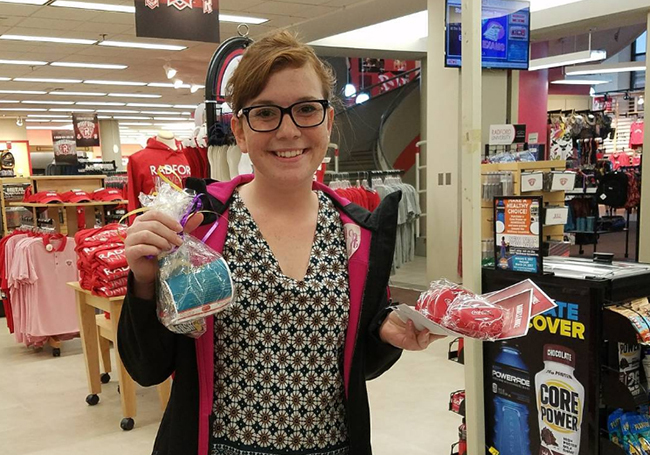 In conjunction with the McConnell Library, Radford Dining, R-SPaCE, and the student programming and event department, the Radford University Bookstore devised the DeStress Egg Fest, a campus-wide treasure hunt that was first suggested by Susan Lesko, the Assistant Store Manager. 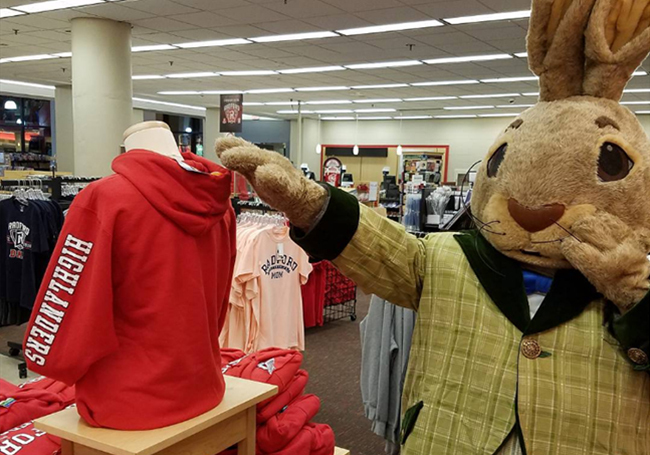 “There’s always a lot of awareness this time of year, with students facing their final exams, and pretty much every department hosts some kind of de-stress event,” explains Jaime Hillman, Radford University Bookstore Manager, “We thought we could use this opportunity as a week-long egg hunt, leading to other de-stress activities around the campus,” she says. The logistics of the event were impressive. One thousand eggs were hidden across the campus for the five-day hunt, and staff were kept busy concealing them in an endless number of creative locations. “We had egg hiders up at six and seven in the morning, hiding eggs before most students were up and about,” says HIllman, “but word spread, and by Wednesday, we were being followed by students.” The egg hiders were also accompanied by another festive caricature, Peter Rabbit, whose appearance around campus helped fuel social media postings from the delighted students and fervent egg hunters. “It’s always exciting to see the ideas that Jaime and her team come up with.” explains Laura Harman, Radford’s Associate Director of University Services. “They’re always creative and enthusiastic in the ways they try to engage the campus, and it’s something the students really thrive on. This event, in particular, was a great way for the students to engage and de-stress going into their exams,” she adds. Students participating in the DeStress Egg Fest hunt were certainly well-rewarded for their efforts. “They really had no idea what the prizes were,” says Hillman, “but they ranged from super-hi bouncy balls to discount vouchers for bookstore products, and free Frosties from our on-campus Wendy’s to dining dollars,” she adds. Many local area off-campus businesses also participated and contributed gas cards, nail salon vouchers and even a $60 certificate from a local tattoo parlor. Freshman student Bailey Martin was particularly surprised and delighted when she found the egg containing the event’s grand prize: lunch with University President, Brian Hemphill. 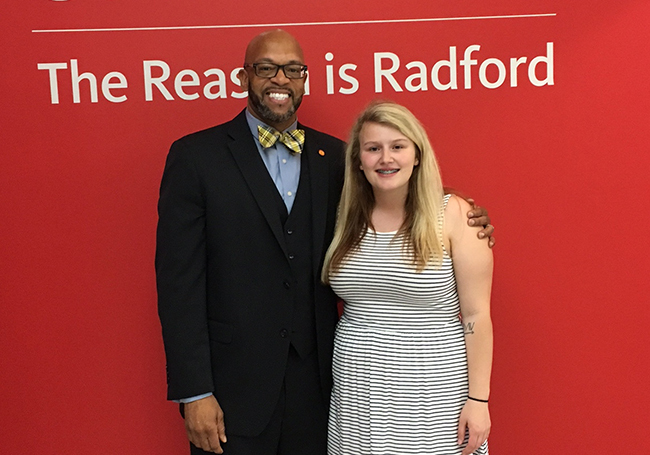 Freshman student Bailey Martin was delighted when she found the egg containing the event’s grand prize: lunch with University President, Brian Hemphill. The Library and the bookstore have traditionally worked together, and Johnson acknowledges the amount of effort the bookstore has invested in partnering with various groups on campus. For Hillman, it’s an integral part of her role as store manager, and she and her staff are ready to show the kind of benefit and enthusiasm the store can bring to campus. “A big part of that is not being afraid to go out and ask the important questions — and develop the campus connections that show the kinds of support the bookstore can bring to events like these,” she says. Harman believes that, if anything, this generation of Radford students has a better handle on managing stress, particularly during finals week. “I think there are more opportunities, particularly here on campus, to be able to take a moment and de-stress, but even though they seem to manage their time better, I still think there is a need to de-stress through the kinds of programs that Jaime and her team help to develop,” she says.